Staff members were telling us that they were tired at the end of the day and all their good intentions to eat a healthy dinner were easily derailed. In our last weight loss program, we also noticed a correlation between eating a lot of prepared foods and being overweight. I started talking with folks about this challenge and one of my contacts at United Healthcare (UHC), Eugenia Perna, told me about Diet-to-Go. 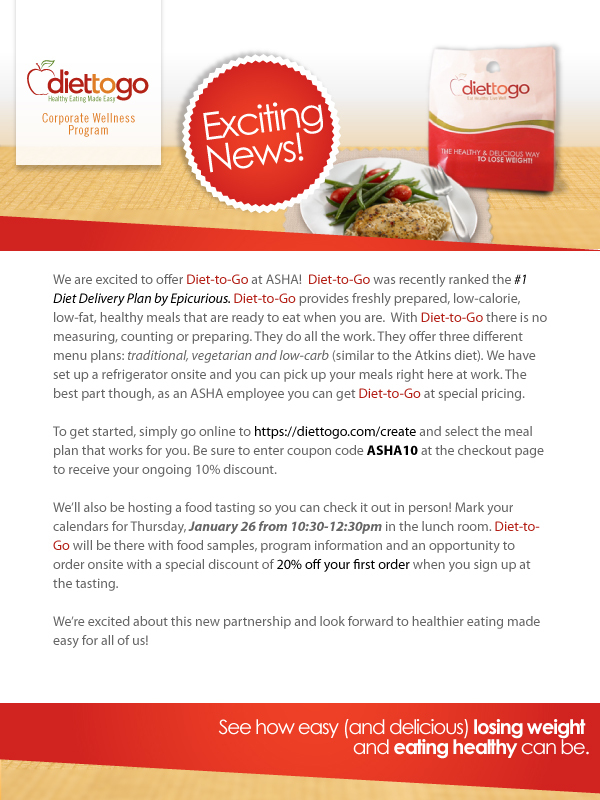 Eugenia arranged for us to meet with staff from Diet-to-Go and we just introduced the program to staff in conjunction with the start of our current Biggest Loser campaign. We held a tasting on January 26 and 30 staff members ordered meals. Many people are using the program to lose weight, but others are ordering meals just for the convenience. We received our first deliver last Tuesday. I ordered three lunches from the low-carb menu to try out the program. Most of the lunches on the traditional/low-fat menu were sandwiches which didn't appeal to me. The meals are individually packaged with heating instructions and nutritional information on the label. I enjoyed two of the lunches -- chimichura salmon with marinated asparagus and creole shrimp stew with a piece of string cheese. The third lunch was 960 calories of chicken wings. I took that home for my son. The people I talked with seem to like most of the meals they've tried although one person did say she felt like she was eating airline food. A few people have said that they're struggling a bit to adjust to the portions -- a sign that they were eating more than they realized before. From an administrative stand point, Diet-to-Go handles most everything. People can call or order online. They receive a confirmation email. If there are any problems with the orders, staff deal directly with Diet-to-Go. Their staff have been friendly and helpful. All and all, an easy enhancement to our wellness program.